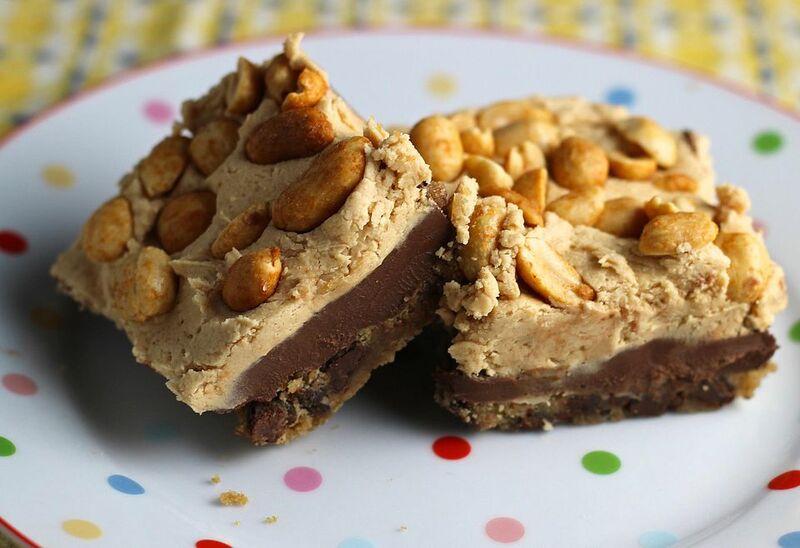 This is an easy layered bar cookie recipe made with refrigerated dough and a peanut butter mousse filling. There's something about the combination of a tender and chewy crust, topped with a rich chocolate and peanut butter ganache, and peanut butter frosting that is simply irresistible. These bars are so simple to make because you start with refrigerated dough. And the filling and frosting couldn't be easier. Preheat the oven to 375 degrees F. Spray a 13" x 9" pan with nonstick baking spray containing flour and set aside. Break the cookie dough into the pan and, using floured fingers, press into an even layer. Bake for 10 to 15 minutes or until just set. Cool the crust for 30 minutes. In a small microwave-safe bowl, combine the chocolate chips and 1/2 cup of the peanut butter. Microwave on high for 2 minutes; remove and stir. Continue to microwave for 30 second intervals, stirring after each interval, until mixture is melted and smooth. Pour the melted chocolate mixture over the cookie layer and refrigerate. Then, in a medium bowl, combine the softened butter and 1 cup peanut butter; beat until smooth. Add the powdered sugar, cream, and vanilla and beat until fluffy. You may need to add more powdered sugar or cream to reach the desired consistency. Spread the peanut butter cream over the chocolate layer and sprinkle with the peanuts; press in slightly so they stick to the frosting. Let the bars stand until set, then cut into squares to serve.